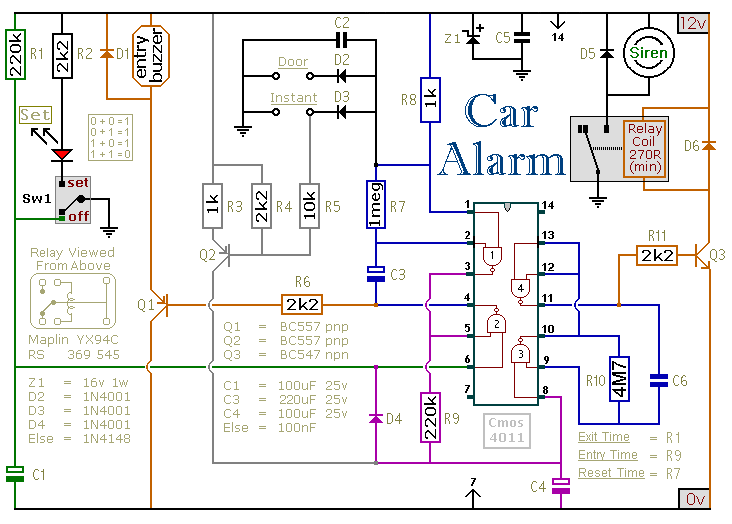 This circuit features exit and entry delays, an instant alarm zone, an intermittent siren output and automatic reset. By adding external relays you can immobilize the vehicle and flash the lights. The alarm is "set" by opening Sw1. It can be any small 1-amp single-pole change-over switch - but for added security you could use a key-switch. Once Sw1 is opened you have about 10 to 15 seconds to get out of the vehicle and close the door behind you. When you return and open the door the buzzer will sound. You have 10 to 15 seconds to move Sw1 to the "off" position. If you fail to do so, the siren will sound. The output to the siren is intermittent - it switches on and off. The speed at which it switches on and off is set by C6 and R10. While any trigger-switch remains closed, the siren will continue to sound. 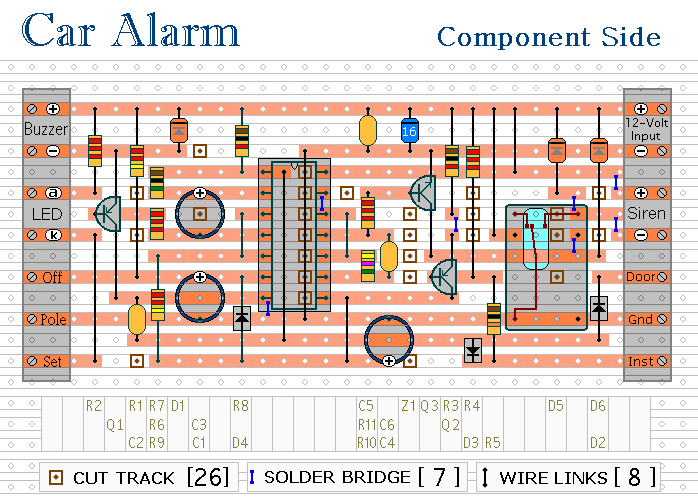 About 2 to 3 minutes after all of the switches have been opened, the circuit will reset. One of the inputs is connected to the vehicle's existing door-switches. This provides the necessary exit and entry delays. It's usually sufficient to connect a SINGLE wire to just ONE of the door switches - they're generally all connected in parallel with the return through the chassis. You can add extra normally-open switches to the door-circuit if you wish; but note that any additional switches will have to be able to carry the current required by your vehicle's interior light. Any number of normally-open switches may be connected - in parallel - to the "Instant" input. Since they don't have to carry the current for the interior light, you can use any type of switch you like. You may want an instant alarm on the bonnet, the boot, the rear-hatch, the rear-doors etc. It doesn't matter if these already have switches connected to the door-circuit. Simply fit a second switch and connect it to the instant input. 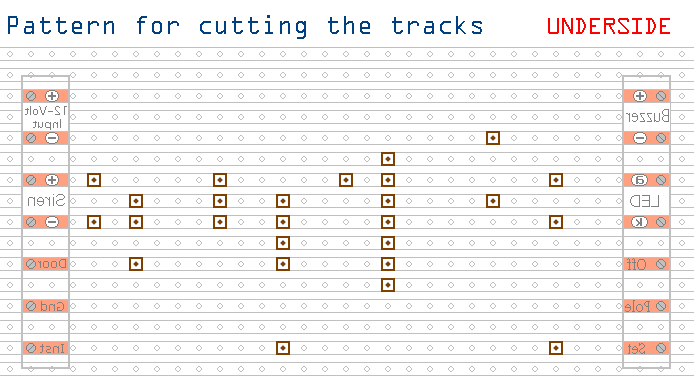 It will override the delay circuit. You can use the chassis for the return. However, a ground terminal is provided if - for any reason - you need to run a separate return wire for either zone. If you're not using the instant zone then leave out Q2, R3, R4, R5 & D3. The exit delay is set by R1 & C1, the entry delay by R9 & C4, and the reset time by R7 & C3. The precise length of any time period depends on the characteristics of the actual components used - especially the tolerance of the capacitors and the exact switching points of the Cmos Gates. However, for this type of application really accurate time periods are unnecessary. The circuit is designed to use an electronic Siren drawing 300 to 400mA. It's not usually a good idea to use the vehicle's own Horn because it can be easily located and disconnected. However, if you choose to use the Horn, remember that the alarm relay is too small to carry the necessary current. Connect the coil of a suitably rated relay to the "Siren" output. This can then be used to sound the Horn, flash the lights etc. Before fitting this immobilizer to your vehicle, carefully consider both the safety implications of its possible failure - and the legal consequences of installing a device that could cause an accident. 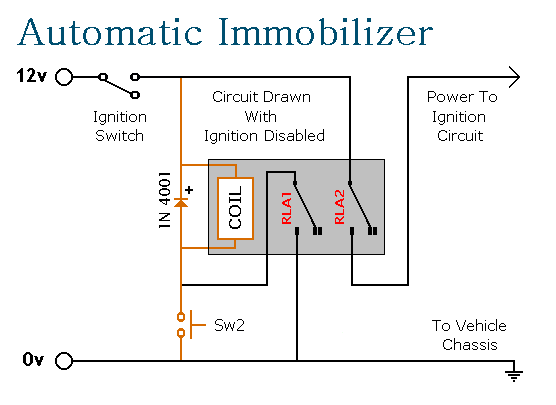 When you turn-off the ignition, the relay will de-energize and the second set of contacts (RLA2) will break the ignition circuit - automatically immobilizing the vehicle. When the ignition is switched on again the relay will not energize; and the vehicle's ignition circuit will remain broken. You must press Sw2 to energize the relay. It then latches itself on using the first set of contacts (RLA1); while the second set of contacts (RLA2) complete the connection to the ignition circuit. The design has a number of advantages. It operates automatically when you turn the ignition off - so there's no need to remember to activate it. The relay uses no current while the ignition is off - so there's no drain on the battery. To de-activate it you'll need to have the ignition key and you'll need to know the whereabouts of the push-switch. Sw2 only requires a single wire because its return is through the chassis. It carries no load other than the current required by the relay-coil. So almost any small "momentary-action, push-to-make" switch will do. For extra security Sw2 could be key-operated.